Pond care can be as simple or as complicated as the pond owner cares to make it. We here at the Fin Farm have found that the number one most important item for pond care is a pond aerator. Pond aerators mix the water and also mix the oxygen in the water. This creates an environment where bacteria can grow. Bacteria consume the nutrients in the pond and break them down thereby reducing sludge, muck, algae, and many odors. There are a variety of types of pond aerators such as Windmills, Fountains, Solar, and Electric bottom bubblers. They all have their places in pond care. A bottom based diffuser type of aerator such as the Bubblemaster works most efficiently at mixing the water and oxygen in a body of water. Along with aeration, we recommend adding Bactrobe a Natural blend of Bacteria and enzymes to your pond. They speed up the decomposition process. These microscopic organisms are Natures cleaners. They are what break down the nutrients in the pond and naturally clean the water and get rid of the muck. Typically the Bacteria is added every two weeks in order to stay ahead of the nutrient accumulation in most ponds. The nutrients come from everywhere, dust, lawn runoff, leaves, fish waste, etc, etc. By using Bactrobe you will minimize the amount of care your pond will need in order to look great. Using pond dye is a great Natural way to slow down vegetation and algae growth. Our pond dyes, Blue, Black and Deep Blue filter out sunlight thereby slowing the plant’s ability to grow. Usually applied twice a year (Spring and Fall) the pond dye leaves your pond a pleasing blue color that is very appealing. White Amur ( grass carp) are another natural pond cleaner, they eat rooted vegetation. Stocked at 10 per acre they can provide many years of vegetation control. Tilapia, a warm water fish are stocked annually in Ohio ponds in late May. They primarily eat algae. We have had great luck using them in our ponds. They normally reproduce during the summer providing a natural food source for many of the predatory fish in your pond. 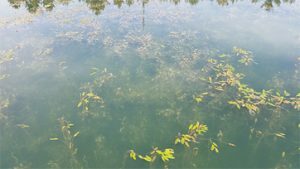 Tilapia will die in the fall, usually, in November, many pond owners catch them prior to that and will clean and eat them. We have found that by using the above combination of Nature-Friendly pond maintenance techniques you can have a beautiful pond. The aerator adds oxygen and creates an environment where bacteria can live, the bacteria clean the water, and the pond dye leaves the water a wonderful blue color. The White Amur (grass carp) another natural pond cleaner, eat the rooted vegetation, and the Tilapia, eat the algae. We like using these techniques in our ponds and believe you will too!